Figure 1: Image of the cosmic web (in particular, the dark matter distribution) from the Millennium Simulation. Every bright point in the image represents a galaxy cluster. The filamentary structure and voids between the filaments are clearly visible here. The background: what is a void? Have you seen videos of the Millennium Simulation? If not, do yourself a favor and go check one out now. The Millennium Simulation is a 10-billion-particle computer simulation of how we think the large-scale structure of the Universe evolved: self-gravitation of matter within the Universe causes filaments and clumps to form, eventually building the complicated structure of galaxies and clusters we see today, which we call the cosmic web. 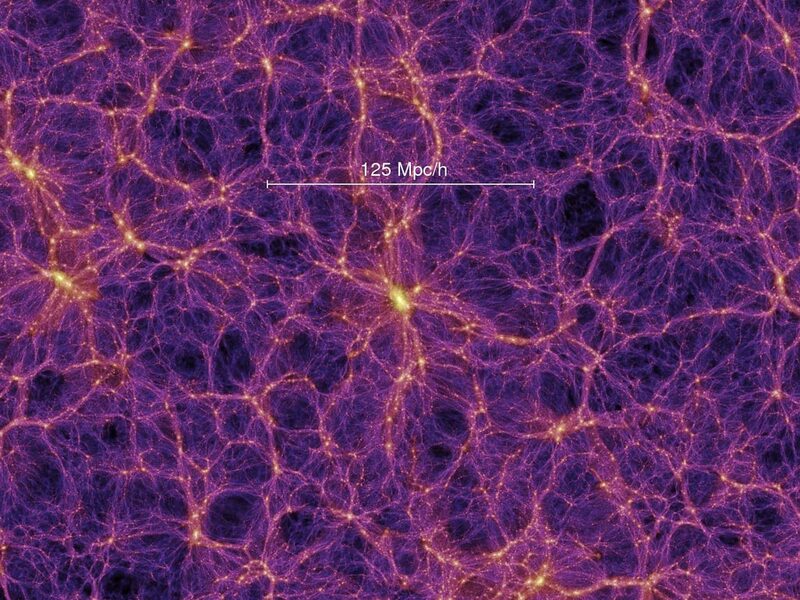 You’ve probably seen images of the cosmic web before (see figure 1) — it’s usually presented with an emphasis on the overdense filaments that contain most of the matter of the Universe. But it turns out that the underdense voids between the filaments are interesting as well. Contrary to their name, these cosmic voids — which have radii ranging from a few to several hundred Mpc — are not just evacuated spaces. They are lower density than the filaments, but each void is still estimated to contain a few tens of dwarf-like, mainly isolated galaxies. These galaxies have radii on the order of a few kpc (compared to the Milky Way radius of ~30kpc), but they are less massive and less luminous than their brethren living in high-density regions. Increasing the mystery of these voids, recent observations have suggested the existence of magnetic fields within them. TeV photons emitted by blazars located beyond the voids generate cascades of charged particles as they pass through the Universe on their way to us. The charged particles in turn produce more gamma rays, which can be detected with telescopes such as the Fermi Gamma-Ray Space Telescope. These cascades, however, are deflected and suppressed as they pass through the voids, which provides strong indication of the presence of a magnetic field. Observations currently estimate a lower limit to this field of 10-15 Gauss (for comparison, the Earth’s magnetic field is ~0.5 Gauss). The question is, how do these voids come to have magnetic fields within them? Figure 2: Schematic illustrating magnetization of cosmic voids. From Fig. 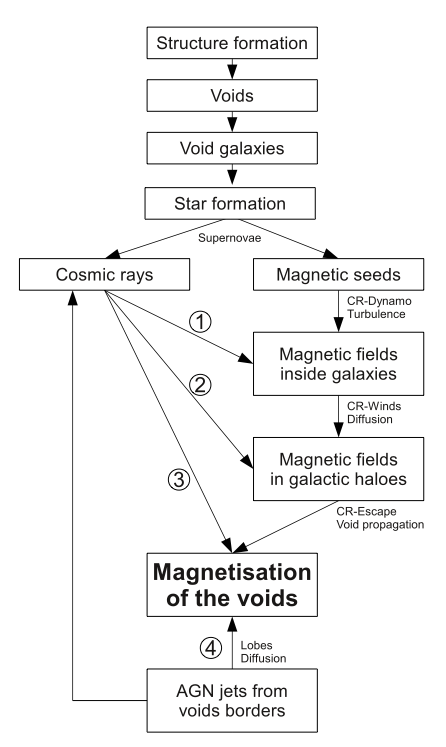 1 of the paper, "Cosmic rays lead to the amplification of the void galactic magnetic field (1), as well as winds escaping into the void galactic haloes (2) and the magnetization of the voids themselves (3), supported by AGNs which border the voids (4)." 2) charged particles from active galactic nuclei (AGN) jets from neighboring filament galaxies. In the first scenario, cosmic rays formed by supernovae within these star-forming galaxies in the voids are accelerated to high speeds. The cosmic rays drive a dynamo that contributes to the amplification of the galactic-scale magnetic field, and they also drive winds that can exceed the escape velocity of the galaxy. As the cosmic rays then propagate into the void, they carry the magnetic field lines with them, transporting magnetic energy far out into the void. The authors estimate that they can magnetize a large enough fraction of the void volume to account for the 10-15-Gauss lower limit observed. In the second scenario, the authors note that the galaxies within voids don’t show any sign of AGN activity and probably aren’t large enough to host supermassive black holes at their centers anyway. That said, the galaxies in the filaments surrounding the void could be very active, and it’s likely that some would have Mpc-scale jets that are directed into the voids. These jets of charged particles carry magnetic fields with them as well, and could therefore also contribute to magnetizing the voids. This scenario, too, could reproduce the lower limit observed. The authors argue that it is likely a combination of these two scenarios that is responsible for producing magnetic fields in voids (see figure 2 for a schematic of this). As the first public catalogs of voids in our local Universe have only recently been constructed, it seems likely that our understanding of these enigmatic regions will continue to increase in the near future. Strands in the Cosmic Web Leaving on a jet stream Exploding stars and sleight of hand: A case of magnetic misdirection Can we a-void the Hubble tension with local voids?